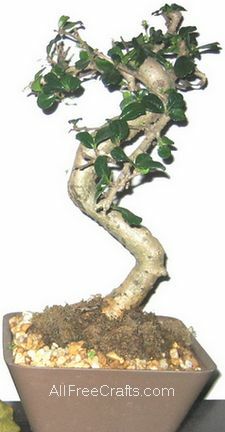 I just bought an inexpensive bonsai tree from Walmart that had dropped some of its leaves and was looking rather bare. At the same time, I was decorating my mantel piece for Halloween and I’d brought out a bag full of small Halloween decorations. Well, you can see here what came of that; I ended up with a Halloween bonsai boneyard which was great fun to make. And you can easily do the same. You don’t even need a bonsai tree. Fake it. Got a dead house plant you’re about to throw out? Rethink. Strip any dried leaves and look at the bare bones of the plant. Wouldn’t it benefit from wispy spider web threads and a spider or skeleton or two for Halloween? You could also get a twiggy branch or two from outside, at least a foot or so long, leave the branch natural or paint it black, then stick it in a pot of sand, soil, styrofoam or whatever will give weight to the pot and keep the branches upright – then proceed as follows. My bonsai tree had moss and gravel glued in place on top of the growing medium. If your plant or potted branches doesn’t have this, add a layer of gravel or moss (without glue) to cover the surface of the soil. 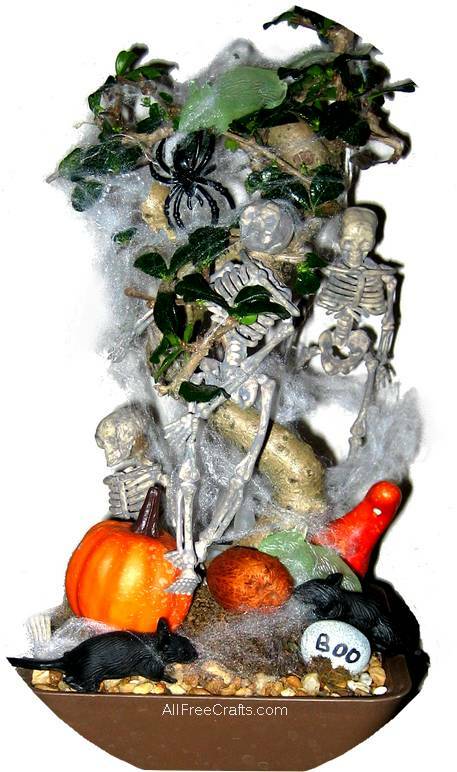 If there is room, use the twine to hang one of the skeleton figures by its neck from one of the branches. If not, lean the skeleton against one of the boughs. Add another skeleton or two wherever there is room, either standing up or sitting down. 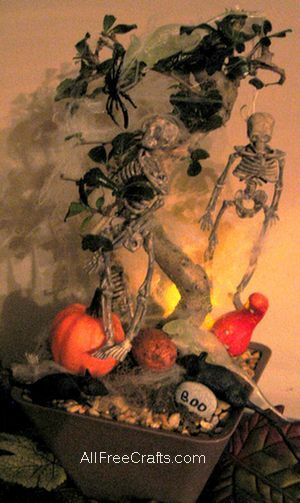 Set the miniature pumpkins or gourd decorations in place, then add mice on the ground, nibbling at the skeletons, or up in the tree – whatever looks good to you. Drape wispy pieces of artificial spider web in strategic places, but try not to cover up the skeleton faces or other decorations too much. My bonsai had a pebble with “Hope” printed on it. I turned the pebble around and wrote “Boo” in black marker then placed the pebble at the front corner of the pot. If using, add a battery-operated tea light candle somewhere to the back of the display and drape with spider web. When you turn on the candle, the spider web will mute the light and create a foggy, shadow aura, just perfect for Halloween.